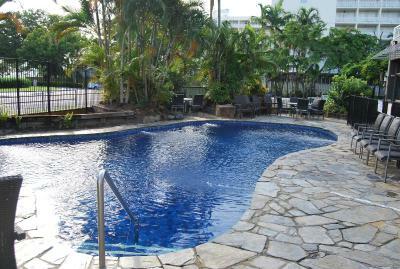 Lock in a great price for Cairns Plaza Hotel – rated 8.5 by recent guests! Pretty great location, amazing ocean view, suite was huge! Staff was very helpful and they offer cheap towel rental for beach or snorkeling cruise so very convenient. Great location. Enjoyed the patio views. So convenient and easy parking. So wonderful to enjoy coffee on the patio. Friendly staff in a great location right across from the esplanade an playground. Lots of great eats nearby. Free parking! No traffic. Clean and friendly. We stayed one night before a trip to the Great Barrier Reef and then three nights after. Spacious rooms but seriously the balcony made us feel comfortable. Don’t forget to take in the city pool, night mats and little Indonesian restaurant next door! Large room with balcony and the locality is perfect. Very good breakfasts available at reasonable prices. We were on the 6th floor which gave us a great view over the city and the water. The location was great - being on the waterfront and close to the wharf, lagoon etc. Breakfast in the hotel was excellent and the staff were very friendly and helpful. Very spacious apartment with sea views. Comfortable bed, good shower. Able to prepare simple meals using the microwave. About a 10 minute walk to the main restaurants and markets. Cafe across the road on the waterfront. Staff very helpful and interested us and our holiday. Loved it. Lovely view, spacious rooms. We came in from long trip from USA and we were able to check in early! Walkable to good restaurants and waterfront. Fun kids playground across the street. Good wifi, across the road from great kids playground, cafe and the esplanade. Right on boardwalk. Easy access to Muddy's cafe. Not far from the busy part of town (Esplanade). Mandy at the desk is a true delight!!! Cairns Plaza Hotel This rating is a reflection of how the property compares to the industry standard when it comes to price, facilities and services available. It's based on a self-evaluation by the property. Use this rating to help choose your stay! When would you like to stay at Cairns Plaza Hotel? This room features a private balcony with lovely views of the city or mountains. Bathtub available on request and subject to availability. This larger room has a balcony with city and mountain views. Your 'home away from home’ is located on The Esplanade along the waterfront opposite Muddie's famous children’s playground. 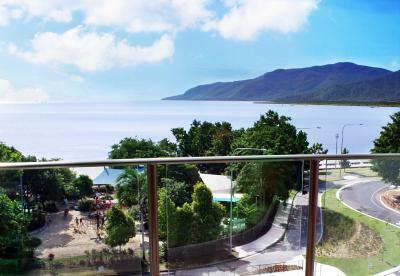 Cairns Plaza boasts spectacular views across The Esplanade/Cairns Inlet with a 24 hour reception for the late traveller. House Rules Cairns Plaza Hotel takes special requests – add in the next step! Cairns Plaza Hotel accepts these cards and reserves the right to temporarily hold an amount prior to arrival. Cairns Plaza Hotel is a nonsmoking hotel. It would be nice if you offered room service. Quite room and very helpful staff. Breakfast very reasonably priced and plenty of choices. Staff helpful and friendly. Hotel basic,clean,good location,room cleaning done every day, Breakfast a bit slow. facing the sea, splandid view! Breakfast was great more than we thought it would be. Staff good. Great location for families: fantastic playground across the road, esplanade and lagoon 5 minutes walk away. Not on the esplanade proper so quiet. Nice pool too. 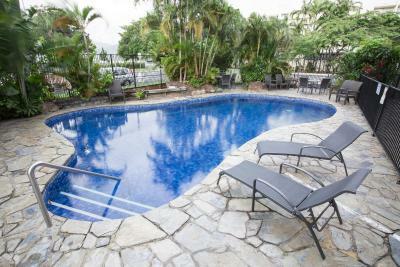 Stunning apartment right by the pool with a gorgeous spacious front balcony. Spotlessly clean, lovely bathroom and comfy bed. Could not recommend more! In the most gorgeous area too. Maintenance was a bit lacking, we were there a week and the automatic front doors were not working (awaiting a fresh and cheaper quote to repair) and a sunken stone in the path still had a hazard cone over it. All in all the place looked a little tiered. Very friendly and helpful staff, in all departments. Good breakfast with a large selection of foods. Staff friendly and helpful. Rooms big and comfortable. Breakfast is ok and could be better. 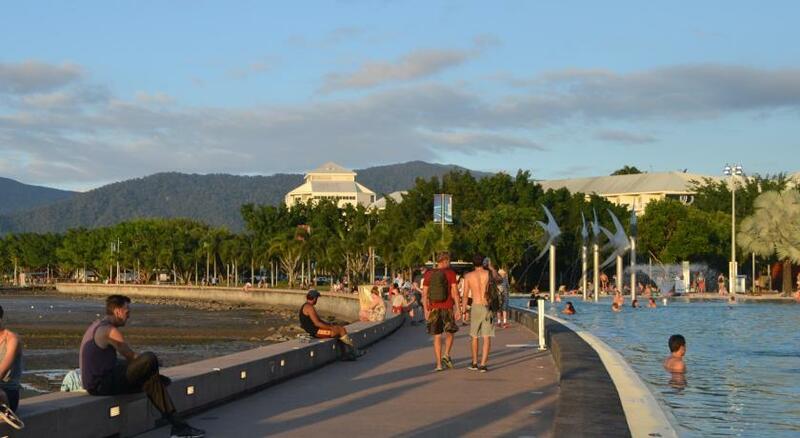 The weather in Cairns was horrible!